Meghan Markle surrounds herself with real life royals, but she's friends with some unofficial monarchs, too. Namely, Serena Williams, Queen of the Tennis Court. Serena and her husband Alexis Ohanian welcomed their daughter Alexis Olympia Ohanian on Sept. 1, 2017 and now the tennis champ is giving her two cents on how she thinks her royal BFF will fare as a mother. 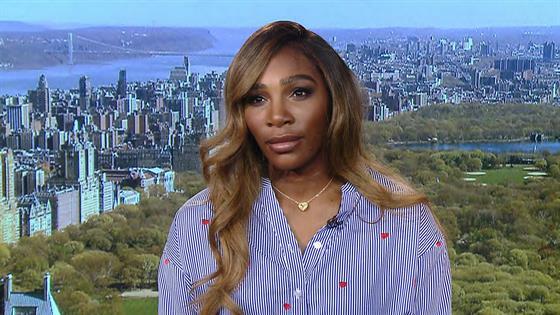 "She'll be the best mom, for sure," Serena told E! News while also chatting about her Pampers Cruisers 360 Fit "Wild Child" program that she's doing. The former Suits star is expecting her first child with Prince Harry any day now. Kensington Palace shared the happy news on Oct. 15, just one day after the couple landed in Australia for their first royal tour together as a married couple. It seems like Serena could not be happier for the Duchess of Sussex. The two of them first met and became close friends at a charity flag football game in February 2014 and have been pretty inseparable ever since. Serena looked like pure royalty at Meghan and Prince Harry's May 19, 2018 nuptials in her pink Versace dress and Bulgari jewels. The 37-year-old also helped throw Meghan the baby shower of her dreams in New York. Her $80,000 shower, which was co-hosted by none other than Amal Clooneyand held at the penthouse of the Mark Hotel, featured other A-list celebrities such as Gayle King, Misha Nonoo and Jessica Mulroney. The get-together included famous harpist Erin Hill as well as bouquets of peonies and roses and a cotton candy machine. The adoration is totally mutual, too. During her royal tour in the South Pacific, Meghan wore one of Serena's blazers from her clothing company Serena. "The face you make when you and Duchess of Sussex Meghan have matching @serena blazers," Serena captioned a photo of Meghan waving to a crowd in Dubbo, Australia. Meghan wrote a bit about their bond in her now-shut off blog called The Tig. "We hit it off immediately, taking pictures, laughing through the flag football game we were both playing in, and chatting not about tennis or acting, but about all the good old fashioned girly stuff," she described. "So began our friendship." The former actress also cheered on Serena at the U.S. Open and other major tennis matches. The Grand Slam champion told The Project in September that she and Meghan talk a decent amount. "You know, we, I think have known each other for a long time. But we really are relying on each other a lot lately," she explained. Serena thinks that Meghan would "definitely agree" if asked about their relationship. She said of the royal wedding, "We were literally watching history. And I feel like in a few years we'll look back at that moment and it's just going to be so historic, that it's going to be something people never forget." As the mother of a young woman, Serena has learned some lessons when it comes to parenting and motherhood. She shared one of those takeaways with E! News. "Accept mistakes and don't expect to be perfect. We put so much pressure on ourselves," she gleaned. "I had all those high expectations and what I was going to do and then I had what I was going to do. I was gonna recover and I was gonna be great, and this is a time that everything is not going to go as planned," she said while discussing what it felt like to be a new mom. "My whole life is so planned and this is the one time where it wasn't. You just gotta go with the flow." Serena also briefly discussed this past year in tennis and some takeaways that she took from the ups and downs. "I've missed every single goal I had for this season, so I'm wiping the board clean and starting over to see where my next goal is. Maybe I just need to stop thinking so much and just go out there and relax," she admitted. "My next goal is to just take a deep breath."